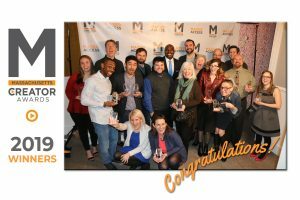 Home » Creator Awards a Success! Thanks to everyone who turned out last night at ICON for the second annual Massachusetts Creator Awards. The MassAccess Annual Meeting portion of the evening was highlighted by the presentation of the State Legislator of the Year award to Representative Matthew Muratore and the Federal Legislator of the Year Award to Congressman Jim McGovern. Representative Muratore was kind enough to join us in person and Congressman McGovern sent a pre-produced video which was played for the capacity crowd on hand. Both leaders were recognized for their outstanding support of community media in Massachusetts and beyond. After some words from MassAccess President Melinda Garfield, Vice President David Gauthier and Treasurer Michael Lynch, it was time for the awards portion of the evening. The decision to announce finalists in each category then announce the winners live proved to be a wise one as it added a dimension of excitement and suspense to the proceedings. The emcee for the evening, NBC Sports Boston’s Kyle Draper, provided a professional and entertaining touch to an already lively event. Short clips of the finalists’ videos appeared on the video wall before Kyle announced the winner in each category. It was awesome to see the excitement that many winners displayed when their winning entry was announced. Congratulations to all who went home with the hardware! LTC News – Lowell Telecommunications Corp.
Our thanks go out to everyone who attended and entered. It’s really spectacular to see so many come together on a cold winter night to celebrate community media and the outstanding production that results from it. Watch for the full video of the evening to be uploaded to MMX for you to download and play on your community stations. Start getting those submissions ready for next year!